Leptonema illini Hovind-Hougen 1979 is the type species of the genus Leptonema, family Leptospiraceae, phylum Spirochaetes. Organisms of this family have a Gram-negative-like cell envelope consisting of a cytoplasmic membrane and an outer membrane. The peptidoglycan layer is associated with the cytoplasmic rather than the outer membrane. 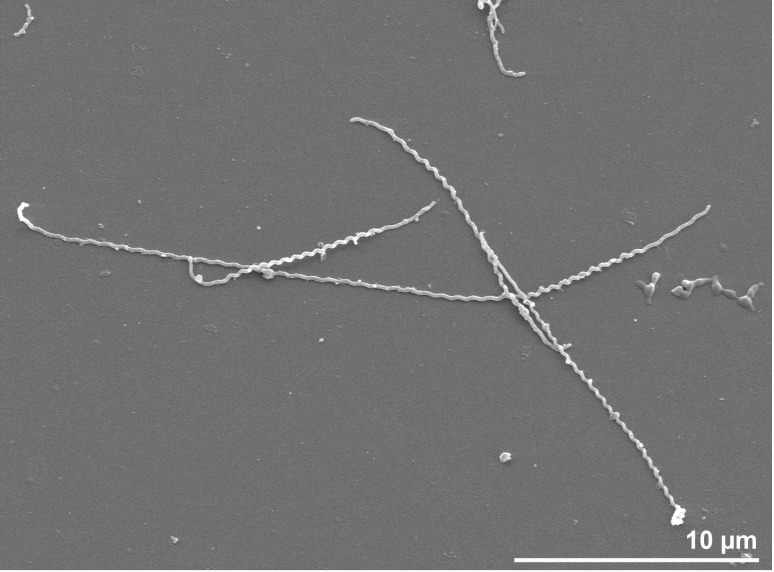 The two flagella of members of Leptospiraceae extend from the cytoplasmic membrane at the ends of the bacteria into the periplasmic space and are necessary for their motility. Here we describe the features of the L. illini type strain, together with the complete genome sequence, and annotation. This is the first genome sequence (finished at the level of Improved High Quality Draft) to be reported from of a member of the genus Leptonema and a representative of the third genus of the family Leptospiraceae for which complete or draft genome sequences are now available. The three scaffolds of the 4,522,760 bp draft genome sequence reported here, and its 4,230 protein-coding and 47 RNA genes are part of the Genomic Encyclopedia of Bacteria and Archaea project. Strain 3055T was isolated from urine of a clinically healthy bull , and was first mentioned in the literature as a new Leptospira serotype, serovar illini [2,3], but as no name was proposed, it was not validly published. This occurred in the comparative study of Hovind-Hougen  who found morphological differences between ‘Leptospira illini’ strain 3005 and other members of Leptospira, i.e. the presence of cytoplasmatic tubules and the structure of the basal complex of the flagella. These differences, together with the finding of a higher DNA base composition and growth behavior  were used as criteria to taxonomically separate strain 3055 from Leptospira as Leptonema illini with strain 3055T (= DSM 21528 = NCTC 11301) as the type strain. This species is the only species of the genus. The family Leptospiraceae was created in the same publication , although the name was proposed before, though not effectively published [J Pilot, Ph D Thesis, University of Paris, Paris, France 1965]. Despite a description in the International Journal of Systematic Bacteriology the name Leptonema was not included in the Approved List of Bacterial Names . The omission of this name was not in accordance with the Bacteriological Code (1990 Revision) Rule 24a, Note 1, but was corrected in Validation List No 10 . 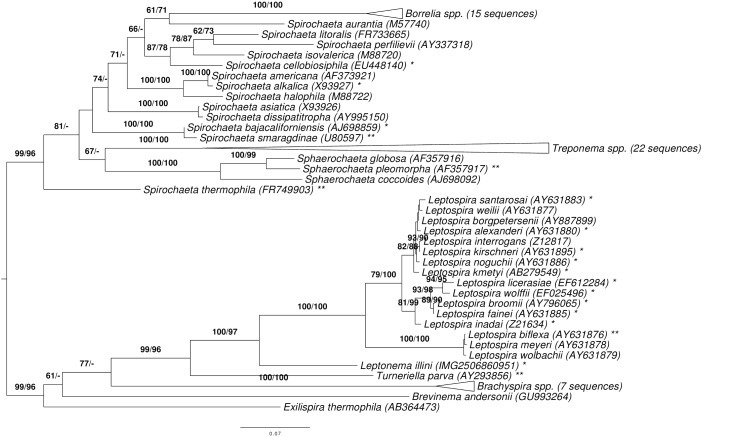 The phylogenetic relatedness among spirochetes and the isolated position of L. illini was first elucidated by 16S rRNA cataloguing  and then by comparative sequence analysis of reverse-transcribed 16S rRNA sequences  and by rDNA analyses [10,11]. The moderate similarity values between L. illini and strains of Leptospira were later supported by the absence of significant DNA-DNA hybridization values between members of the two genera [12-14], 16S rRNA restriction fragment analysis  and PCR amplification of the 16S-23S ribosomal DNA spacer . Application of a 16S rRNA gene real-time PCR assay to leptospiras  confirmed the presence of L. illini strains in kidneys of Indian rats and bandicoots. Here we present a summary classification and a set of features for L. illini strain 3055T together with the description of the complete genomic sequencing and annotation. The rationale for sequencing the genome of this non-pathogenic strain is based on its isolated position within the phylum Spirochaetes. The single genomic 16S rRNA gene sequence of L. illini 3055T was compared using NCBI BLAST [18,19] under default settings (e.g., considering only the high-scoring segment pairs (HSPs) from the best 250 hits) with the most recent release of the Greengenes database  and the relative frequencies of taxa and keywords (reduced to their stem ) were determined, weighted by BLAST scores. The most frequently occurring genera were Leptospira (53.4%), Anaeromyxobacter (31.6%), Leptonema (11.5%), Turneriella (1.3%) and Desulfomonile (0.8%) (96 hits in total). Regarding the three hits to sequences from members of the species, the average identity within HSPs was 99.7%, whereas the average coverage by HSPs was 97.4%. Among all other species, the one yielding the highest score was Leptospira wolbachii (AY631890), which corresponded to an identity of 86.4% and an HSP coverage of 76.8%. (Note that the Greengenes database uses the INSDC (= EMBL/NCBI/DDBJ) annotation, which is not an authoritative source for nomenclature or classification.) The highest-scoring environmental sequence was EF648066 (Greengenes short name 'dynamics during produced water treatment aerobic activated sludge clone HB63'), which showed an identity of 99.2% and an HSP coverage of 98.4%. The most frequently occurring keywords within the labels of all environmental samples which yielded hits were 'microbi' (5.2%), 'soil' (2.3%), 'anaerob' (2.3%), 'industri' (2.0%) and 'ecolog' (1.4%) (154 hits in total). The most frequently occurring keywords within the labels of those environmental samples which yielded hits of a higher score than the highest scoring species were 'microbi' (4.5%), 'cell' (3.1%), 'prmr' (3.0%), 'sediment' (3.0%) and 'coral' (3.0%) (12 hits in total). None of these keywords provides useful information about the close relatives of strain 3055T in the environment. Phylogenetic tree highlighting the position of L. illini relative to the type strains of the other species within the phylum Spirochaetes. The tree was inferred from 1,325 aligned characters [22,23] of the 16S rRNA gene sequence under the maximum likelihood (ML) criterion . Rooting was done initially using the midpoint method  and then checked for its agreement with the current classification (Table 1). The branches are scaled in terms of the expected number of substitutions per site. Numbers adjacent to the branches are support values from 550 ML bootstrap replicates  (left) and from 1,000 maximum-parsimony bootstrap replicates  (right) if larger than 60%. Lineages with type strain genome sequencing projects registered in GOLD  are labeled with one asterisk. Those also listed as 'Complete and Published' with two asterisks (see [29-35] and CP003155 for Sphaerochaeta pleomorpha, CP002903 for Spirochaeta thermophila, CP002696 for Treponema brennaborense, CP001841 for T. azotonutricium). The collapsed Treponema subtree contains three species formerly assigned to Spirochaeta that have recently been included in the genus Treponema, even though those names are not yet validly published . No data are available for fatty acids, quinones or polar lipids. The G+C content of the DNA was previously reported with 51-53 mol% , which is below the value inferred from the genome sequence (see genome statistics table). L. illini strain 3055T, DSM 21528, was grown in DSMZ medium 1113 (Leptospira Medium) at 30°C. DNA was isolated from 1-1.5 g of cell paste using MasterPure Gram-positive DNA purification kit (Epicentre MGP04100) following the standard protocol as recommended by the manufacturer with modification st/DL for cell lysis as described in Wu et al. 2009 . DNA is available through the DNA Bank Network . Stackebrandt E, Chertkov O, Lapidus A, Nolan M, Lucas S, Hammon N, Deshpande S, Cheng JF, Tapia R and Goodwin LA. Genome sequence of the free-living aerobe spirochaete Turneriella parva type strain (HT), end emendation of Turneriella parva. Stand Genomic Sci. 2013; (this issue).